In poker, a bluff is an action, such as a call or raise, made to deceive one's opponents. The main objective of this deception is to persuade an opponent or multiple opponents to fold despite the bluffer holding an inferior hand. Bluffing is an integral aspect of optimal strategy for any competitive poker game. There are two primary types of bluffs: the pure bluff and the semi-bluff. The pure bluff, also called a stone-cold bluff, is a call or raise on a hand that has a low or zero chance of improving. In other words, the player makes the bluff believing that an opponent fold is the only way to win the pot. In a game with multiple betting rounds, a semi-bluff is a bluff made in one round with the awareness that the inferior hand may improve in a later round. It is different from the pure bluff in that the player has multiple ways to win. Not all actions that cause a fold are a bluff. For instance, a player on a draw but with a strong chance to win may make an uncertain call that results in fold, but that call is quite different from both a pure bluff and semi-bluff. From the perspective of all involved players, a bluff can have a positive, neutral or negative expectation. A player determines expectation based on pot odds and appraisal of the opponent(s). If a player were to pure bluff by betting the size of the pot and figured the probability of an opponent call to be fifty percent, then from his perspective, this would be a bluff with neutral or even expectation (50/50). In the same scenario, the opponent (the non-bluffer) faces 2-to-1 pot odds. If that player believes that there is at least a 33% chance that the bet was a bluff, then she would have a positive expectation when calling it. 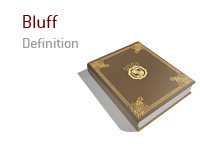 Bluffing also exists in other games, such as contract bridge, Scrabble, Stratego and spades.